NEW ORLEANS – When it came to the discussion about the elite men in collegiate track & field in 2017, the conversation centered on the same 10 men: KeAndre Bates, Edward Cheserek, Christian Coleman, Grant Holloway, Fred Kerley, Josh Kerr, Emmanuel Korir, Ioannis Kyriazis, Filip Mihaljevic and Lindon Victor. So it’s only right that those 10 men who combined for 21 NCAA titles in 2017 are semifinalists for The Bowerman, the highest individual honor in collegiate track & field. The list was released Thursday by the U.S. Track & Field and Cross Country Coaches Association (USTFCCCA). Bates fell off The Bowerman Watch List on May 18 and June 5, but returns when it counts. The Florida horizontal jumper became the 7th man in NCAA DI history to sweep the long jump and triple jump at the same outdoor meet (His former teammate and 2015 The Bowerman winner Marquis Dendy was the last in 2015). Cheserek wasn’t able to cap his career in style, yet did enough during the indoor season to warrant his spot on this list. The former Oregon Duck won a pair of NCAA titles in College Station, Texas (3000/5000) and broke the collegiate indoor record in the mile. Coleman polished off a double of his own, winning the 100- and 200-meter titles at Historic Hayward Field. It was during the semifinals last Wednesday where Coleman broke the 6-year-old collegiate record in the 100 with his time of 9.82 (The old mark was 9.89 set by former The Bowerman winner Ngoni Makusha in 2011). Coleman joins Justin Gatlin as the only men in NCAA DI history to win the indoor 60-200 and outdoor 100-200 crowns. Holloway played an instrumental role in helping Florida win back-to-back team titles. The freshman from Chesapeake, Virginia, won the 110 hurdles, finished runner-up to Bates in the long jump and anchored the Gators’ 4×400 relay. Holloway is the only man in NCAA DI history to finish in the top-2 of the 110 hurdles and long jump at the same NCAA meet. Kerley polished off an undefeated year in 400-meter finals this past weekend with another top-10 all-time performance. The Texas A&M senior, who already owns the collegiate outdoor record in the event (43.70), clocked a time of 44.10 to win by 59 one-hundredths of a second to give him four all-time top-10 marks in 2017 alone. Kerley also helped the Aggies win their first 4×400 crown since 2014. Kerr won the 1500-meter crown at Historic Hayward Field to go along with his indoor mile title. The New Mexico sophomore is the first to accomplish that feat since Texas’ Leonel Manzano in 2008. Korir wrapped up his freshman season with an 800-meter sweep. The Kenyan avoided disaster in Eugene when he and teammate Michael Saruni got tangled up. Korir kept his feet – Saruni did not – and held off Penn State’s Isaiah Harris at the finish line. Kyriazis took his full allotment of attempts this past weekend and rolled to the javelin title. His second heave set a meet record (82.58m/270-11) and the Texas A&M junior ended up winning by more than 19 feet. Mihaljevic earned two titles in throwing events at NCAAs in the shot put and discus. The Virginia senior toppled Colorado State’s Mostafa Hassan in the former and Kent State’s Reginald Jagers in the latter. Mihaljevic actually won the discus title on his sixth and final attempt. He is the first man to sweep the discus and shot put crowns since Ryan Whiting in 2010. Victor won his second NCAA decathlon title in a row and added another top-10 mark in the record book. He totaled 8390 points, which puts him 7th all time. Victor now owns the No. 1, No. 2, No. 6, No. 7 and No. 8 marks all-time in the decathlon. 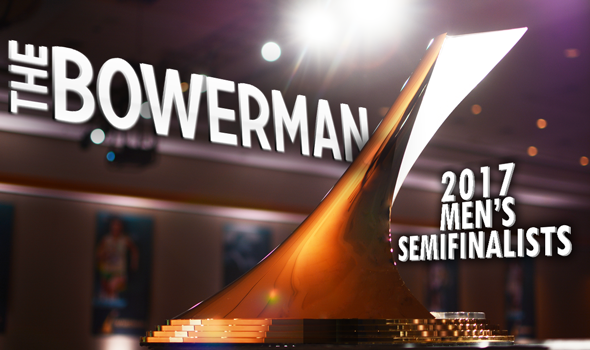 Finalists will be announced Thursday, June 22.